How to bring a touch of natural Africa home – Alison Fennell Art has become The Pottering Artist – please join me at www.thepotteringartist.com today! Using appealing and animated watercolor elephant prints in groups brings a happy herd right into your space! A fun talking point and a great mood enhancer – animal art is affordable and unique in my store. Look how Elisa Williams Schroen of Toronto has created a beautiful ethnic and African vibe in her powder room. Elisa – who works at the Faculty of Medicine at the University of Toronto wanted to add a natural animal feel to this space and was drawn to the elephants to do this! Gallery overheads are not a concern in my Etsy store:) This is how I can offer art at a price that is perfect for you if you wish to personalise your own home with walls filled with paintings and prints of your choice. The frames are stunningly simple and perfectly mitred with a timeless yet modern edge and as the saying goes “Simple is best, less is more”! Congratulations to her framer who is none other than… her husband! Thanks Elisa for sharing these photos of how you had your elephant paintings framed and how you placed them for an inspirational effect. The elephants Elisa chose were from my Etsy Gallery. All of my archival giclee animal prints are 8×10 inches and frame ready. Prices are $19 plus $6.50 shipping. My original watercolors start at $30 plus shipping so come on over and see if you find an animal that will spark your own art collecting days! 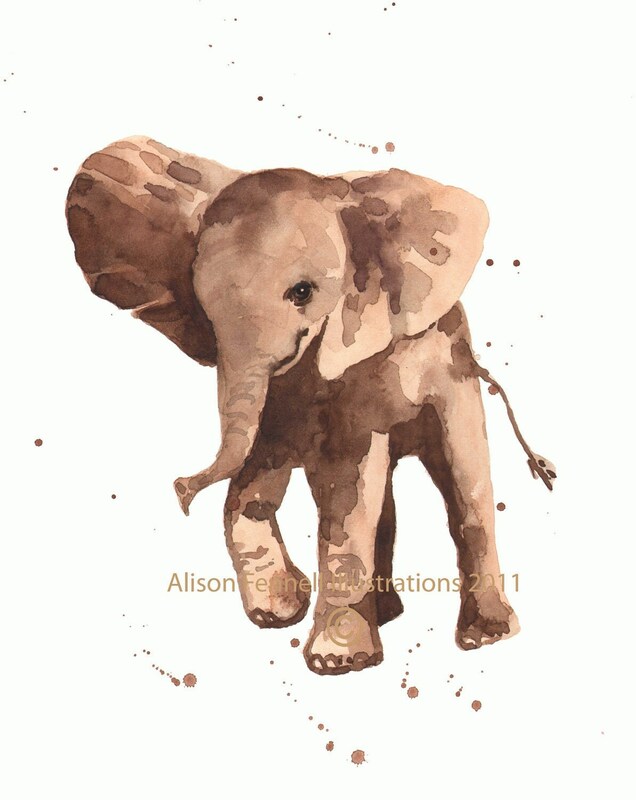 Click here to see my current elephant range should you be looking to create a savannah feel at home this summer too:) There are 9 for you to choose from and of course I can always paint you one in a different colour if needs be. Elephant welfare all over the world is getting more and more coverage which is great and here is a fabulous project all about an elephant called Jack – which you may find interesting! I love your work you show here on your blog…fabulous!! wow the elephant is so pretty cute. Previous Previous post: May I Introduce you to my Life Coach?